Threads of glass pulled from re-melted Bullseye Compatible sheet. Available in 2mm and 1mm. 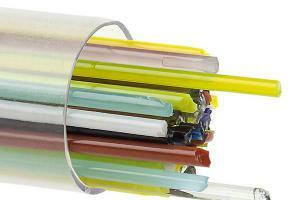 Fine Line (0.5mm) are also available in select colours. Please email us info@artglassstudio.com.au for availability on these. 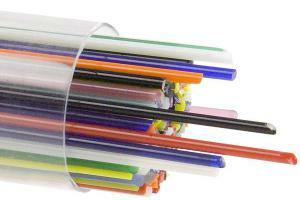 Stringers are approximately 17.75″ (451mm) long, packed in clear plastic tubes. Tubes are packaged by volume. A tube of 0.5mm stringers contains approximately 340 pieces. A tube of 1mm stringers contains approximately 123 pieces and a tube of 2mm stringers contains approximately 50 pieces. To reduce unit price, tubes of gold-bearing colours contain fewer stringers. For example, a tube of 1mm Cranberry Pink (001311) contains approximately 87 stringers and a tube of 2mm contains approximately 33.